In winter, paying utility bills becomes an issue for many households in Armenia. Some people take out loans to pay, while others seek financial assistance from relatives residing outside the country. 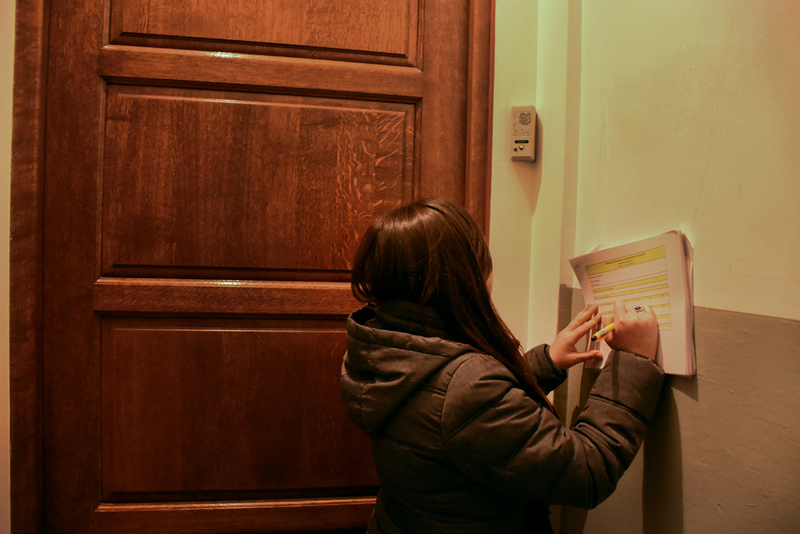 In December 2017, Hetq visited 70 households in multi-apartment buildings located in eleven of Yerevan’s twelve administrative districts, to find out the ratio of utility bills to monthly winter income. The families surveyed spend an average of AMD 40,000 monthly to pay utility bills. This includes home heating. This means that regardless of income, the amount of utility bills for those surveyed is almost the same. Consequently, the lesser the average monthly income, the greater the burden of paying utility bills. The monthly income of 70% of the families doesn’t exceed AMD 250,000. 22% of these families consist of five or more people. Thus, the amount allocated to each person in these households doesn’t exceed AMD 50,000, which is less than the average per capita monthly income (AMD 59,690 according to the National Statistical Service). Most of the families with monthly incomes of less than AMD 250,000 consist of retirees. Families with monthly incomes of more than AMD 250,000 consist of working people. To get the ratio, we have divided the households into six groups, according to monthly income: 1)less than 50 thousand drams, 2)50 - 100 thousand drams, 3)100 - 150 thousand drams, 4)150 - 250 thousand drams, 5)250 - 400 thousand drams և 6)400 and more thousand drams. Monthly income includes salaries, pensions, allowances, and sums generated from private activities. In winter, average monthly utility bills of 28,000 drams, make up 74% of these families’ income. Even the slightest increase in gas or electricity prices may have a major impact on the social status of the households in this group. In some cases, utility bills exceed monthly income by around 40%. Such households either borrow money or seek financial help from their relatives living abroad. Pensioners comprise 72% of this group. 4-year-old Alvard must get her grandma’s permission every time she switches on an electric heater. Alvard's grandmother, Seda Vardanyan, says that every month she borrows some money from her neighbor and pays it back when she receives her pension. Seda's neighbor is one of the few people whose utility bills do not exceed 5% of the monthly income. She is an interpreter by profession and has a monthly income of more than 400,000 drams. These families spend around 40% of their monthly income on utility bills in winter. Their average utility bills are 25,000 drams per month. More than half of this income group are pensioners, 28% are unemployed, 13% are minors, and 8% are employed. Hrant Aloyan has authored more than thirty scientific articles. He has eight copyright certificates in computing technology. Hrant receives a monthly pension of 50,000 drams ($103), and spends around 10,000 drams on medicines. Despite dozens of years of scientific activity, Aloyan, whose daughter is still a student, cannot afford paying all their expenses without the help of his relatives and friends living abroad. Utility bills of this group, an average of 36,000 drams, comprise around 30% of monthly income. Pensioners and unemployed still comprise a majority, but the number of employed is 10% higher than in the previous group. Seda and Hamlet Alexanyan are pensioners, Hamlet also works. Their monthly income is 140,000 drams. They don’t accept assistance from their children who live abroad. Seda says a proper planning of expenses helps cover everything. At the beginning of each month, the couple purchases the basics, saving money and time. Moreover, Hamlet continuously compares food prices in stores and markets to buy everything cheaper. This group, mainly composed of young families, allocates an average of 24% of the income to utility bills, which average 47,000 drams in winter. The demographic picture is equally distributed here: minors (27%), employed (27%), unemployed (25%) and retired people (21%). Mels Hayrapetyan and his wife recall that the piano was the first property they bought for their apartment in the 1970s. Two of their four children received musical education. They say the piano is still in a good shape, awaiting their grandchildren to play. The family consists of seven people - two pensioners, three minors, one unemployed, and the only employed person, Mels’s son. More than 20% of the income is spent on utility bills during the winter months, and quite a lot is spent on medicines. Mels got operated on several months ago, and he needs regular checkups and medicine now. His daughters help to cover these expenses. The higher the income - the warmer the apartment, which means that utility bills are also increasing. The ratio in this group is like the previous one - 18%. Approximately half of this group are employed (47%), the rest are pensioners (25%), unemployed people (17%) and minors (11%). Lieutenant Colonel Tigran Harutyunyan served at the Armenia’s Ministry of Defense for many years. He says he was illegally sent to retirement because of his disagreement with the shortcomings of the system. Now, he receives a military pension, works the plot of his summer house that provides most of the food of the family, and has some private business. There are six people in the family, two of whom are minors. In winter, 22% of the household income is spent on utility bills. All of Tigran’s children reside in Armenia. He says that regardless of social conditions, the unity of the family is very important for him, because it’s the key to happiness. Employed people (51%) dominate in this group. The rest are unemployed (20%), minors (20%) and pensioners (9%). In these families, there are two or more people with average salary or one with a higher income. Those with high income are programmers or private entrepreneurs engaged in trade. The higher the monthly income of the residents, the more difficult it is to get them to open-up and talk frankly. After answering a few questions from behind the door, they finally invite the Hetq journalists in. One of the respondents, who asked to remain anonymous, has a monthly income exceeding 1.5 million drams. An entrepreneur, he says that utility bills have never been a problem for him, but he is concerned with the injustice and lack of rule of law in the country, especially in the business sphere. He claims to have made proposals to the government about the introduction of solar energy, but they didn’t reach an agreement. His children study in Europe. He’s now thinking about exporting some business branches to the west. 68% of respondents heat their homes with natural gas; 32% with electricity. The average temperature in apartments we visited was 19°C. We conducted the survey from December 16-28, when the average outside temperature was 6°C. Despite a warm winter, we were able to calculate the impact of utility bill payments on the respondents’ social situation, since we came up with an average number of the utility payments and income of the last two years. We obtained the addresses of multi-residential buildings on the two main streets in each administrative district from the Yerevan Municipality. Using the random sample survey method, we selected on multi-residential building. We visited an average of six apartments per building. talking to the families who responded. (We knocked on all apartment doors, in turn). Our questionnaire was designed to provide a snapshot of the family’s socio-economic status. Each respondent, without exception, was asked all the questions it contained. very good work ! Thanks, HETQ ! now I know approximately how much the family I support neads REALLY for utility bills in winter. I thought much more..